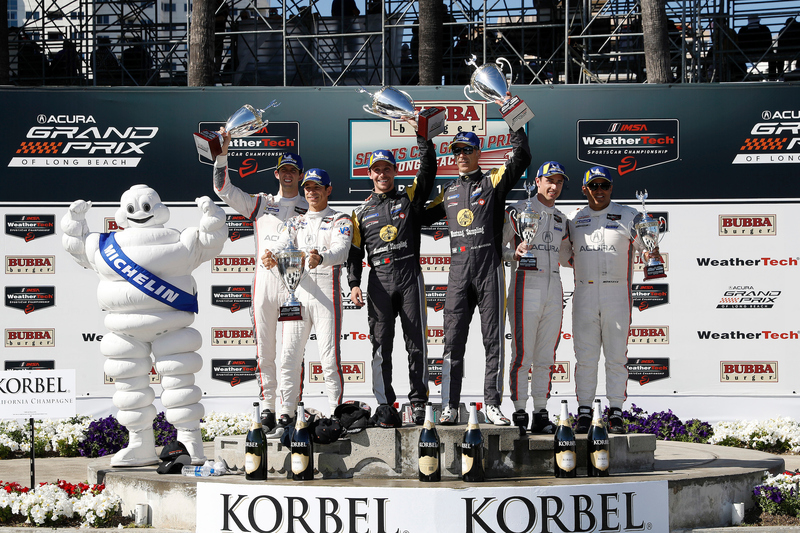 Sebring winners Porsche GT Team opened their Long Beach weekend in good form. Nick Tandy and Patrick Pilet share the No. 911 Porsche 911 RSR, and set a best time of 1:17.549 in the GT Le Mans class at the 1.968-mile street course. Tandy described how much the track evolves over the course of the two-hour session. This kicks off the BUBBA burger Sports Car Grand Prix. “Yeah actually it wasn’t so bad at the start considering we’re the first cars on track. That’s always a big problem. We know this every year though,” Tandy said. “By the end the racing line is pretty clean. We knew the track evolution, and we saved our new tires right to the end of the session when the track was at its best. The Long Beach track constantly evolves over the weekend. The IMSA cars are essentially some of the world’s fastest “street sweepers” during the practice session. With other series and other tire brands present, there is a significant change in evolution from morning to afternoon before the second practice at 4:45 p.m. PT. Qualifying then occurs later in the afternoon, at 5:40 p.m. PT for GTLM.